What Are Mini-Split Heating Systems? Mini Split units are great for small server rooms, garages, gaming rooms, home theater rooms, small and large offices, and new additions added to your house. The Friedrich Mini-Split heating systems with a heat pump, are for those homes already possessing non-ducted heating systems. Mini-split heating systems are a great option to add onto existing heating elements. 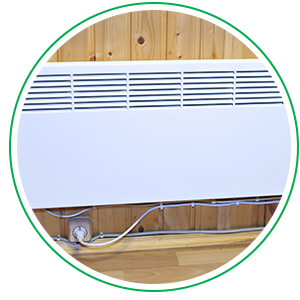 Ductless heating systems require typically hydronic power (such as hot water heaters) and utilize space heating methods that generate heat through kerosene or propane. Mini-splits are ideal when you’re planning on making home additions because expanding existing duct work can be problematic in certain situations. A compressor or condenser that is situated outside of the home. An air-handling unit that is located indoors. These separate components are linked through a conduit which consists of a power cable, condensate drain, refrigerant, and suction tubing. If there are numerous air-handling units, each will contain an associated thermostat which is helpful for regulating the air temperature in each room. Is a Ductless Heating System Right for Your Home? When it comes to heating one’s home, increased efficiency is highly sought after. For this reason, many are electing to install ductless heating systems, also known as mini-splits. Heating systems that utilize duct work are found in a majority of homes and businesses and can consistently lose energy due to the way heat is dispersed throughout a home. Conversely, mini-splits can greatly reduce the heat and energy loss common among ducted systems. Additionally, mini-splits with heat pumps offer easy installation and other great features. Ductless mini-splits with heat pumps may prove ideal with add on features, there are a few disadvantages to such systems. This can include a higher initial cost, which can be a hindrance to those on tighter budgets. The following information can help homeowners determine whether a mini-split system would be right for them. When it comes to adequately heating individual rooms or zones within a home, mini-splits with heat pumps are highly effective. This efficiency has to do with the individual air-handling units that are placed within a given room or area in the home. These units can be adjusted to heat only those rooms which are currently being occupied, unlike conventional heating methods, which provide heat uniformly throughout a home. In most cases, better insulation of a home will have an impact on the overall efficiency of the individual air-handling unit. This can help homeowners save on energy costs throughout the year. Maintaining existing interior design is far easier when utilizing mini-splits. This is because the air-handling components provide a number of placement options, which is not always the case when installing other types of add-on systems. Air-handlers can be fixed to a wall, suspended from the ceiling, and even mounted into drop ceilings. There are also various options for floor models, which can be beneficial for certain circumstances such as improved energy efficiency and the ability to customize. Inefficient use of energy is not only detrimental to the environment, but it can also greatly increase utility bills. Ducts are notorious for losing energy due to their construction, with up to 30 percent of generated heat dissipating while making its way through duct work. Because mini-splits don’t require ducts to disperse heat throughout a home, they aren’t subject to the same energy losses. Another great feature of mini-splits is the ability to customize. Most systems come with features like timers and built-in sleep functions, giving homeowners greater control of when and how they heat their homes. Traditional heating systems usually don’t allow for customized use, which can lead to unnecessary charges, as well as a less efficient use of energy.